This page has 2 core strengthening exercises to include in your core workouts. Core training is a philosophy that focuses on developing stability around the pelvis, hips, spine, and shoulder girdle. The plank exercise is one of the most popular core training exercises, and there are many different variations of the plank exercise. The frog kick or plank knee raises is a way to increase the muscle work in your abdominal muscles when you're doing the plank. Here are 2 frog kick variations of the plank. Starting Position: Begin in the modified plank position. Balance on your hands and knees. Keep your hands under your shoulders and your knees hip width apart. Form: Begin by using the drawing-in maneuver to stabilize your core. Exhale and lift your rigt knee towards your right elbow. Hold for a brief second at the top and then slowly return to the starting position. Personal Trainer Tips: The goal of this core exercise is not to simply lift your knee towards your elbow. The goal is to remain as stable as possible while moving, so pay particular attention to the position of your lower back. The higher you lift your knee, the more muscle work you will feel. Attempt to touch above your elbow, but if you cannot reach your elbow or touch above your elbow, simply move as far as you can. You may feel muscle work in the front of the hip (hip flexors/ iliopsoas), but this is normal. Starting Position: Begin in the plank position. Balance on your hands and feet. Keep your hands under your shoulders and your feet hip width apart. The plank is one of the best core strengthening exercises. It is an indirect ab exercise, which simply means that the abdominal muscles work to stabilize the spine while the leg is moving. The shoulder stabilizers and hip stabilizers also work during the plank exercise. 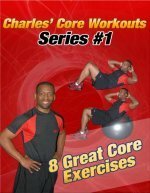 Read my article on Core Exercises for a Better Body or learn 14 Core Training and Core Workout Tips. Also, visit the Picture Directory of Core Exercises and Ab Exercises to learn all the core strengthening exercises on this website. Ride the wave of fitness with Abraham Concepcion C.P.T. Ab's Personal Training, P.E, Life Stile & Weight Management. Improve YOUR F.I.T.T. levels with Abraham Concepcion's NEW! Personal Training Program Wave Physical Training you can see REAL results work!